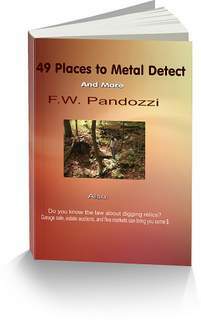 Although I don't do metal detecting, I would love to at some point in the future! What I do is dig for beach glass. 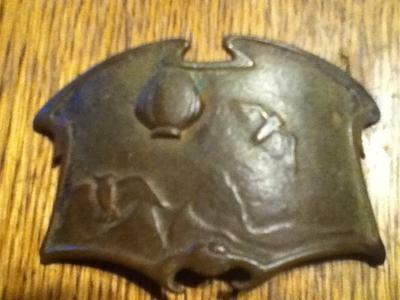 I have found a few rings, a silver spoon, and this past summer while digging I found this belt buckle. It seems to be brass, from it's weight and color and small, maybe a child's size (about 3 inches across). It may be just a store bought buckle, but thought that the owls, mountains and hot air balloon (a strange combination) may be specific to a club or something. At first I thought the birds where bats, but on closer examination, they have "horns" like owls. Any help? Thanks! Found on the shore of Green Bay waters on the Upper Michigan/Wisconsin border. tell Tom Frank Pandozzi sent you. They have a section where people try and identify finds. I will also post your story at my Facebook page. There is no writing on it that I can see. There are double clasps on the back running top to bottom about 1 inch apart with an extra hook type on one side. Tracy, We Will Try and Identify! Hi Tracy, thanks for your post. That is an interesting find. Does it have any markings, or words on it? How about on the back? Is there a clasp? Let's see if we can have someone identify this for you. Also, get a metal detector. You're already on the beach. There is no telling what you're walking over. You don't have to spend a lot of money for a detector. When you are ready to decide, just contact me through my website here. I'll help you!